I don’t drink a lot of energy drinks because caffeine is generally all that I need when I want a little pick-me-up, but there are occasions when I need or want a little more (some afternoons right around 4pm…) and reach for an energy drink instead of regular coffee. The problem with energy drinks is that a lot of them aren’t that good, so ones that include coffee tend to appeal to me a little bit more than others. 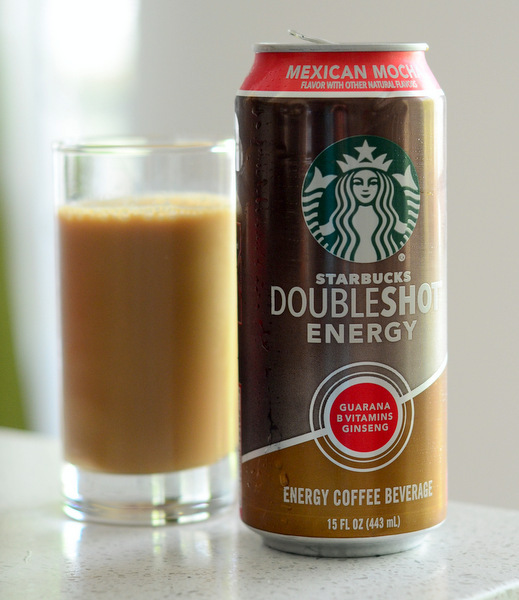 One new offering from Starbucks right now is the Starbucks Doubleshot Energy Mexican Mocha, which was released along with a Spiced Vanilla flavor. The canned drink, which I picked up at one of my local supermarkets, uses the same coffee base as the regular Doubleshot Energy drink and adds chocolate, cinnamon and cayenne pepper to the mix. The original, for reference, includes caffeine, ginseng, guarana and B vitamins. The drink was creamy and sweet, with a nice mocha flavor and detectable notes of cinnamon and spice. It was enjoyable and recognizable as a Mexican Mocha, and there was more than enough flavor there to cover up the fact that this was an “energy” drink. That said, I think that they should have been a little more generous with the spices – especially with the cayenne – to make the Mexican Chocolate concept really stand out from the crowd. This version is mild compared to some I’ve had and I simply prefer mine with a little more spice. Still, it was tasty and not a bad afternoon pick-me-up on a hot summer day.